With the introduction of Intel® 3D NAND SSD technology, solid state drive capacity is increasing while the price per gigabyte is declining. Although this means lower cost, high capacity SSDs, it places cost and availability pressure on lower-capacity, entry-level SSDs. As the size of the base NAND media increases, so do the challenges of designing small capacity SSDs. ...Additionally, the cost per GB of lower capacity SSDs is increasing relative to larger capacity SSDs within the same series because the non-media component costs become a larger percentage of the overall SSD cost. It is these factors that are making it more difficult to produce and procure lower capacity SSDs. However, there are still certain usage models that do not require higher capacity SSDs. One example is boot drives in server appliances where using a high capacity SSD leaves much of the capacity unutilized since the space required for the installed operating system and applications is not growing as fast as SSD capacity. A good use for this unutilized capacity is to assign unused space as a caching partition. 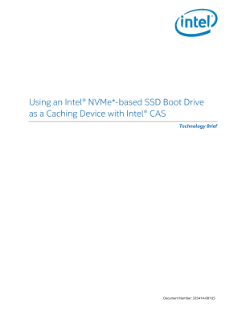 Intel® Cache Acceleration Software (Intel® CAS) enables the creation of caching partitions in an easy and user-friendly way. The user installs the software and an Intel® SSD to get the most from the database, virtualization, hosting, cloud, or big data servers.